2011 National Council of College Arts Guest Performers 10yrs. The leaders Chaz and Loretta Russell were grounded in world music tours with Roy Brooks, Tito Puente’, Orthello Molineaux, Max Roach, Aretha Franklin, Margie Joseph, T. J. Hemphill, Hugh Masekela and More! Stevie Wonder, Trinidad Tripoli Steel Orchestra, Len “Boogsie” Sharp, Ramsey Lewis, Bob, Imani & Ziggy Marley, Jimmy Cliff, Marcus Belgrave, Tito Puente, Chalkdust, Michael Kernahan, Liam Teague, Celia Cruz, Andre Crouch, Lena Horn and Roy Brooks, Mahalia Jackson, Harold Smith, Donald Vales, The Hawkins Family, Harold Mckinney Family, “Straight Ahead” are some of the inspired this groups colors of music and energy! Continued today by Bruno Mars and The News Boys. The Band started September 15, 1988. After a head concussion that left him speechless, Chaz Russell started The Gratitude Band in “thanksgiving of healing”. 1 panist and 2 vocals. The trio put their pan and gospel together in a style called Gospelypso. Although there were a few that admired the style, the band found it’s success with high energy island styles with positive messages. Along with their music therapy backgrounds and international performances, Gratitude continues to bring good vibes to the arts, maintain respect for Afro Cuban innovative rhythms, and still helps to relieve stress through music. Good vibes at business events, showing hours of skill at concerts and preparing jam time shows for celebrations such as birthdays, weddings and graduations, they’re always pushing to be the best in entertainment. The Gratitude Steel Band began playing Wedding Ceremonies and Bar Mitzvahs and then The Detroit Auto Show 3 times , The Detroit Grand Prix and more. They began playing for mayors, congressmen and senators and governors. they aspire to perform at The White House. They’ve performed the National Arts Council in conjunction with Princeton and University of Michigan. Also performed university commencement entertainment across the US. They’ve also done work for The Detroit Symphony Orchestra, The Jackson Symphony Orchestra and The Art Institute. They’ve been part of school judging in Trinidad and Tobago for competitions leading toward Panorama through Pan Trinbago. They’ve performed for inmates, elderly, the handicapped and numerous race entertainment for disease cures and fun (d) raising! They’ve taught steel pan to 3rd graders up to high school and a senior steel band up to 95 years of age …. They’ve written a book called “Discover The Steel Drums” and have done numerous cds and videos including original music. 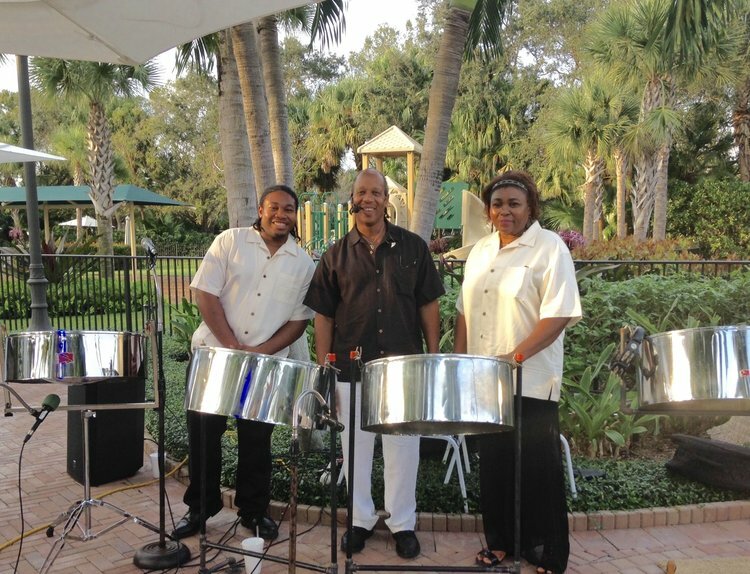 The Gratitude Steel Band plays and sings these styles…. ! Calypso, Reggae, Hawaiian, Gospelypso, Jazz, African, Salsa, Latin and old and new Many American Popular Dance Tunes.